Trees, decorating, Christmas cards, parties, school programs, family gatherings and traditions, wrapping, baking, shopping and MORE shopping. It’s exhausting to even think about all the ‘to do’s’ during the holidays. Because of this, it’s hard to stay balanced during the holiday season. I can’t believe the holidays are upon us again! I know everyone says it, but this year has been a whirlwind and gone too fast. Unfortunately the whirlwind of the year tends to carry over into my holiday season and can often leave me out of balance. I get bogged down with all my “to-do’s” that I don’t take a step back to enjoy the season and its true meaning. I know I’m not the only one out there who tries to do a lot to make the holidays magical. If you are like me, these tips could help make this season stay balanced and even more enjoyable! One thing that tends to steal my balance is adding too much to my plate. All of a sudden I have taken on too much and I find myself ready to pull out my hair from the stress. 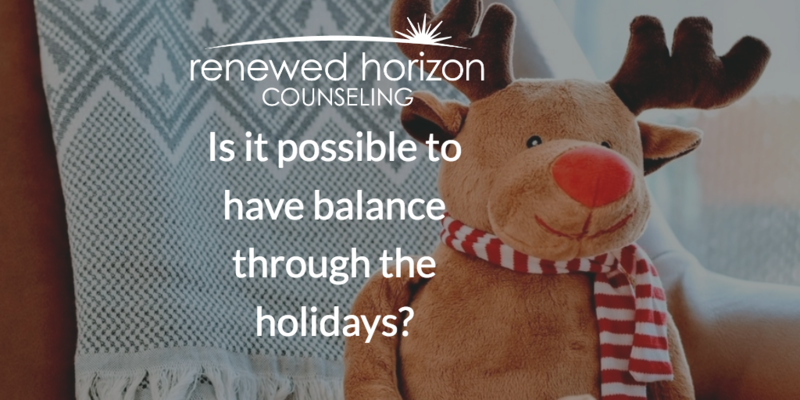 Saying no to tasks, events, and even family and friends can help you take the holidays at a slower pace and stay in balance. Remember that saying yes to too much shows that you have unrealistic expectations of yourself. It’s time to admit that you’re human and can only do so much. Know your limits and work within them. What are your priorities? What do you value most? Once you have these in focus, they can help you determine what to say yes or no to. If you are saying yes to things that are more about making someone else happy or it doesn’t match up with your priorities and values, you may need to re-think if you will participate. Focusing on your top priorities and letting go of things that aren’t as important to you will help if you are getting overwhelmed. I know I can tend to have a “super woman” complex. But the reality is that I can’t do it all. This is when it is vital to lean on others for help. It is important for me to figure out what I need and communicate it to those around me. Don’t expect people to read your mind and just know what you need. You have to speak up and let them know. Delegation is a great way to stay in balance. Getting enough rest and taking care of your body through diet and exercise are great ways to take care of yourself, but they aren’t the only ways. Sometimes self-care is just about getting organized and not waiting until the last minute. Also having a positive support system can be a great way to take care of yourself and stay in balance. In the busyness of this season, don’t exhaust yourself to the point that it’s not even fun. One of the ways I do this is by staying dedicated to Advent reading. This is a daily pause I take to focus on the real meaning of Christmas and the joy of celebrating Our Savior being born to save us! Staying emotionally aware is an important way to keep balanced. How many of you let your emotions build up until they explode? When I check in with myself, I ask, “What’s your deal?” This helps me take a step back and look inside to see how I’m doing. Once I do a status check with myself, I can see if I am doing too much and if I need to re-think all I have going on. This helps me regulate my emotions and stress to keep them from taking over. I truly love the holidays. One of the best gifts you can give yourself is the gift of fun- and your family will appreciate it too! If you get too serious with all your to do’s, it robs you of the joy that this season can bring. Make having fun a priority this year. My family always enjoys a good Christmas music dance party to get the fun started! So let’s commit to a fun and balanced season together, so we don’t wish away this awesome season of celebration of the love shown to us through Christ’s birth. Does anyone have any suggestions on ways to have fun this holiday season?